With blunt, short muzzles Tibetan Spaniels are small dogs with hare-like quick feet. Their tails are plumed and their ears are fringed with tufts of fur. The Tibetan Spaniel dog breed originated in Tibet. Tibetan Spaniels are about 10 inches (51 cm.) in height. Tibetan spaniels may be solid, multicolored or shaded versions of gold, cream, fawn, red, white, black or black & tan. The soft silky coat of the Tibetan Spaniel should be brushed regularly. Once a year their coat will come out in clumps. The Tibetan Spaniel is an average shedder. Small and intelligent, Tibetan Spaniels are not lap dogs. They enjoy sitting atop high objects and surveying their surroundings. 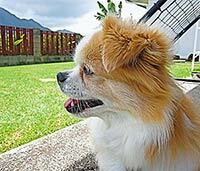 The Tibetan Spaniel is perky sweet and willful and makes good watchdog, barking at intruders or anything unusual. Because of their short faces, Tibetan Spaniels may encounter breathing problems. This breed is also prone to overheating. A Tibetan Spaniel may be expected to live about 12-15 years. Tibetan Spaniels can do well in an apartment provided they are exercised. They enjoy being walked and playing in small open spaces. 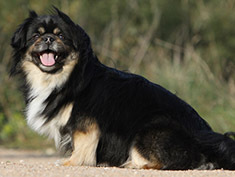 The Tibetan Spaniel is in the Non-sporting group. 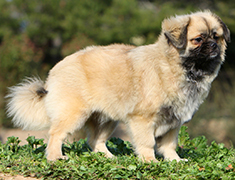 The Tibetan Spaniel is an unusual breed in the west. Fondly nicknamed Tibbies, these dogs were not registered with the American Kennel Club until 1984. But they are known to have been present in the country for nearly twenty years before that. And breeding them started in the UK before the end of the 19th century. There is now a Tibetan Spaniel Club of America and at least two regional clubs, one in Florida and one in the Finger Lakes Region in Upstate New York. Tibbies are popular as house pets in families where they do not need to be left alone. They are devoted to their owners and are very affectionate, eager to please them, and sensitive to their moods. They make good watch dogs as they will bark at anything strange approaching, but they are not aggressive so cannot be used as guard dogs. They will be patient with children as long as they are not abused. Tibet Spaniels are great watch dogs, but aren't aggressive enough to make good guard dogs. Also very intelligent, they will often believe they know better than their owners, so training is very important. And it is better not to let them run free, but to keep them on a leash, as it can be difficult to get them to return when called. However much they love you, they think for themselves, and if they don’t agree that you need them to be near you, they just won’t come. But they are easy to satisfy with exercise and do not need excessive amounts. Two short walks a day is sufficient. Originally the companions of Tibetan monks, Tibbies would be given watch dog duty on the walls of monasteries which were often perched high in the mountains. What they like best of all is still to find some high vantage point to sit and watch what is going on. In this way they can be quite cat like, climbing on your furniture and spending time on your bedroom windowsill, but unlike cats, they will be quite noisy when someone strange turns up. Tibbies are slow to take to strangers, but if the person is around enough, he or she will eventually be accepted as one of their family and welcomed like every other member. People who are not familiar with them sometimes mistake them for Pekingese, and their appearance does have some similar features. But they are larger with much longer legs. A typical fully-grown dog is about 10 inches high at the withers, and its length from there to the tip of its tail is just over that. He will always be alert and will carry his small head majestically. This, together with his mane of longer hair, earned the breed the nickname ‘lion dog’ when, in centuries past, Tibbies were given as gifts between the Tibetan monasteries and Chinese palaces. The rest of his coat, except for the tail and backs of the legs, is fairly short so he will only need occasional grooming, except during his annual moulting, which you should help by brushing him daily. He also has high set ears with feathered fringes that need weekly attention. Females may have an additional moult after they finish their season, but this also only happens once a year. If you choose a Tibetan Spaniel for your house-pet, he will reward you with loyalty and devotion, watching out for strangers approaching your property or your children, and sharing affection and cuddles when it’s time to relax. Find Tibetan Spaniel Puppies with our Free Breeder search!